My nearly 48 year obsession with that tomato-based brunch cocktail known as a Bloody Mary has taken a new twist. Still tomato-based, still using vodka....but instead of a heavy tomato juice I used a bit of tomato shrub I made from an overabundance of tomatoes from a recent CSA pickup. Picture this. A tall glass of ice, a little vodka (or maybe a wee bit more), a touch of beautiful tomato pink shrub, a hint of Tabasco and a bare splash of seltzer...voila! Who knew that traditional brunch cocktail could be made light and refreshing?! Okay Will Groves...YOU did. Thank you Will Groves, Butterjoint and the Pittsburgh Cocktail Week class I took at this very fine establishment! What's a shrub, you ask? It's a simple method of preserving fresh fruits - and sometimes vegetables or herbs - in a sugar and vinegar solution. The shrub can then be used in both alcoholic and non-alcoholic beverages and vinaigrettes. You know...I bet it might make a mighty fine drizzle over roasted or grilled chicken, too. I'll have to give that one a shot! It's basically one of the methods employed, before the age of modern refrigerators and freezers, to save the freshness and flavor of summer. Now why would a craft cocktail bar have an interest in preserving? Because Butterjoint is the bar inside of Pittsburgh's North Oakland restaurant, Legume. Owner of both Legume and Butterjoint, Chef Trevett Hooper is renowned for his expertise in preserving - particularly pickling. The fruits of his passion grace the menu at Legume throughout the year. Will Groves, Bar Manger at Butterjoint, serves up an array of very creative cocktails made of some intriguing shrubs and other pickling products he and Chef Trevett have made throughout the year. Chef Hooper shares his knowledge on a regular basis via hands-on classes right in the restaurant kitchen. The post on Dinner Plan-it last year at the sauerkraut makingclass? That was at Legume with Chef Trevett at the helm! So you know it's only natural then that the bar side, and Will, shares knowledge and expertise, too. Education is part of the DNA at Legume and Butterjoint! The shrub class? The bar was packed with eager learners, all in our places (with bright shiny faces), each student equipped with a bar glass of papery-husked ground cherries, a deli container of pineapple pieces submerged in sugar and another deli container of vinegar produced by none other than Chef Trevett and his staff. We husked ground cherries and plopped the freed fruit into a glass while Chef and Will spoke about preserving methods, the varieties of shrubs and pickles they make at Legume and Butterjoint and various uses for the resultant pickled products. Then we got down to business. 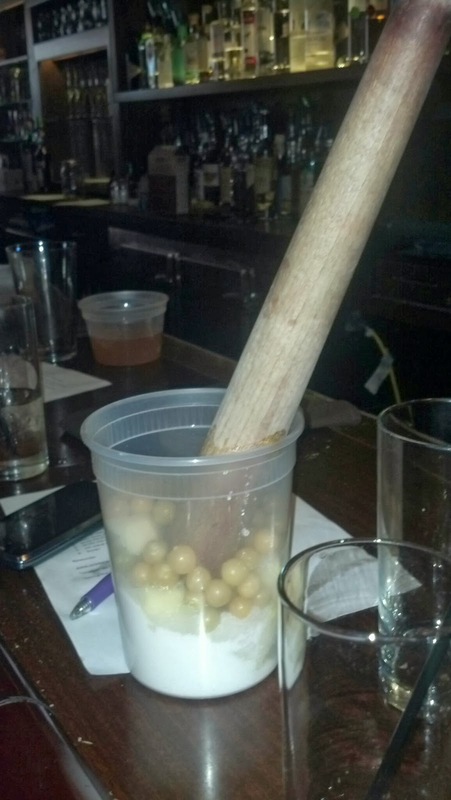 Ground cherries, sugar and pineapple were laboriously crushed together into a sweet, juicy pulp with aid of the biggest muddler I've ever seen. Almost the size of a baseball bat...well, a kid's bat anyway...the job was done quickly and efficiently. Next we.......put lids on the vinegar and the pulpy mass and took it all home! The next steps were undertaken several hours later instead of in class. And then again several hours after that. And then some aging was in store. You see time, patience and waiting is involved in a good shrub. According to Chef Trevett, the purpose of preserving is to "capture moments of time." So well said. Baseball bat or muddler...YOU be the judge. The bottled result of our labors were beautiful. And delicious! So good, in fact, the next day I put up a batch of tomato shrub and a separate batch of tomato basil shrub. My friends Jenn and Michael of the blog 101 Achievements (who were seated next to me at the bar for the class) were inspired to make tomato shrub and prune plum shrub. Yes, shrubs are that good and that easy to whip up! Another bonus of making shrubs is that it can be made with less than perfect fruit since you're just going to smash it all up anyway. Confession time here...I didn't wait the entire recommended time to try my tomato shrub. (You're not surprised, are you?) Without waiting for the aging and mellowing, it still made for a perfect brunch cocktail that tickled the palate with a tart, sweet, lightly vinegary, tomato-y and energizing zinginess. Don't get me wrong, I'm not about to go cold turkey on my old favorite Bloody Marys. How very nice, though, to have something new in my arsenal of Sunday brunch cocktails that's both old and familiar, yet new and deliciously different at the same time. You know, it just might be time to have a few friends over for brunch...and new cocktails! In a tall glass filled 3/4 of the way with ice, stir together everything but the seltzer or club soda. When it's well combined, add a splash or two of soda or seltzer, give a gentle stir and garnish. Serve with a straw. Put tomatoes in a plastic or glass wide container, add the sugar on top and just let it sit, undisturbed and unstirred for several hours until the juices are drawn from the tomatoes and the sugar becomes wet. Muddle the tomatoes and sugar until well incorporated. Cover securely. Let sit for 4 hours. Stir or shake and add the vinegar. Stir well, cover and let stand for at least 12 hours and up to 2 days. Strain out the solids with a fine mesh sieve, pour the liquid into a clean jar or bottle and refrigerate at least 5 days to mellow. After that, it's ready to use in cocktails, sodas or whatever your heart desires. Check out more shrub recipes online and enjoy! OR...look for a shrub class at Legume or Butterjoint and get there!